This Post has already been read 1838 times. 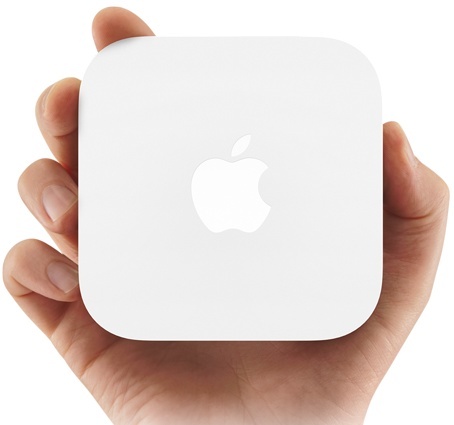 Apple updates its AirPort Express wireless router, adding support for simultaneous dual-band 802.11n WiFi. The new version (model MC414) gets a all-new compact design that is just like a Apple TV in white color. With support for dual-band WiFi, the AirPort Express can transmit data at both the 2.4GHz frequencies at the same time, delivering enhanced wireless speeds. The AirPort Express includes support for AirPlay and has an audio outpu jack, which can turn any speakers to be AirPlay-capable. Music can be streamed wirelessly from PC or Mac with iTunes or iOS devices to the speaker connected to AirPort Express using an audio cable. The WiFi router also has a USB port that allows you to share your printer for wireless printing. Apple’s new AirPort Express supports WiFi 802.11a/b/g/n and WiFi Protected Access (WPA/WPA2), WPA/WPA2 Enterprise, WEP security standards. It is price at $99.